I’d like to thank my friend Caitlin for drawing my attention to the article below. Often male street artists are lionised for getting their work into difficult or spectacular locations and Shamsia Hassani should certainly be celebrated for making her work in one of the most dangerous locations in the world! Go sista! You rock! INSIDE the blackened ruin of Kabul’s cultural centre, a spray-painting of a woman in a burqa sits at the foot of a staircase to nowhere, beside a line of poetry mourning everything that has been lost to Afghanistan in three decades of violence. 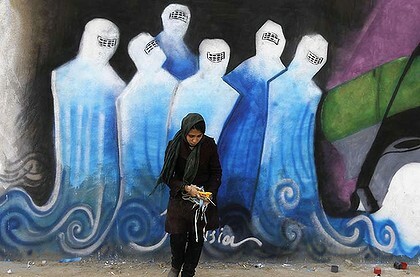 The painting is the work of Shamsia Hassani, 24, probably her country’s first serious graffiti artist. ”The water can come back to a dried-up river, but what about the fish that died?” is her translation of the line, written under gaping holes gouged through the concrete walls by shells when battles raged through the area. ”When I heard this poem, I thought how it was about the situation in Afghanistan. A lot of people died in the war; now the situation is better, but those people cannot come back,” said Hassani. She is an associate professor of sculpture at Kabul University and draws, paints in oil and is a founding member of a contemporary art collective, Rosht, or ”growth”. She was introduced to graffiti when a British artist, Chu, flew out in late 2010 to hold a week-long course in street art. The obstacles in a city at war, policed by jittery security forces, discouraged most other students on Chu’s course, even though the high walls and giant concrete blast barriers are a tempting blank canvas. For women, there is also street harassment; even those who go out wearing the burqa can meet leering compliments on their hands and ankles. So Hassani works in industrial yards and abandoned buildings, such as the cultural centre. ← Spelling it out: burqua, burqa, burkha, burka? Bugger! What i’m trying to do with my art is to get people to reflect on their own feelings or beliefs around womens constructed identities. My own feelings are that women who wear the burqa in australia are very brave given the social ostracism they often recieve. i think women should wear whatever they want to and i think we should all be questioning where the power lies in making that decision.